Few people can resist looking in the pet shop window to see what cute puppies and kittens might be inside. But a closer look into how pet shops obtain animals reveals a system in which the high price paid for "that doggie in the window" pales in comparison to the cost paid by the animals themselves. The vast majority of dogs sold in pet shops, up to half a million a year, are raised in "puppy mills," breeding kennels located mostly in the Midwest that are notorious for their cramped, crude, and filthy conditions and their continuous breeding of unhealthy and hard-to-socialize animals. 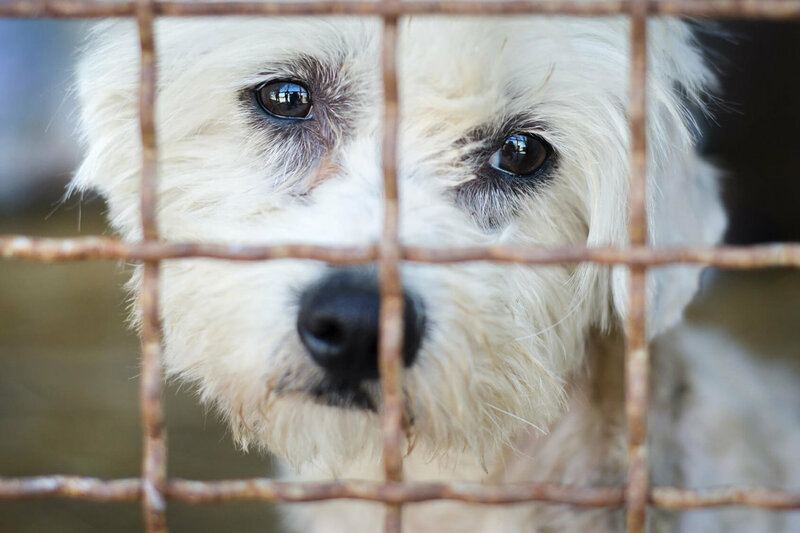 Puppy mill kennels usually consist of small wood and wire-mesh cages, or even empty crates or trailer cabs, all kept outdoors, where female dogs are bred continuously, with no rest between heat cycles. The mothers and their litters often suffer from malnutrition, exposure and lack of adequate veterinary care. Continuous breeding takes its toll on the females; they are killed at about age six or seven when their bodies give out, and they no longer can produce enough litters. The puppies are taken from their mothers at the age of four to eight weeks and sold to brokers who pack them in crates for transport and resale to pet shops. Puppies being shipped from mill to broker to pet shop can cover hundreds of miles by pickup truck, tractor trailer and/or plane, often without adequate food, water, ventilation or shelter. The U.S. Department of Agriculture (USDA) estimates that 25 percent of the 3,500 federally licensed breeding kennels have substandard conditions. The USDA is supposed to monitor and inspect the kennels to make sure they are not violating the housing standards of the Animal Welfare Act, but kennel inspections take low priority at the USDA and the kennels are not regularly inspected. Even when violations are found, kennel operators are rarely fined, much less shut down. Persistent offenders often refuse the Animal and Plant Health Inspection Service (APHIS) personnel access to their facilities to conduct inspections. Puppy mills are rarely monitored by state governments. Dogs from puppy mills are bred for quantity, not quality, causing unmonitored genetic defects and personality disorders to be passed on from generation to generation. The result is high veterinary bills for the people who buy such dogs, and the possibility that unsociable or maladjusted dogs will be disposed of when their guardians can't deal with their problems. Dogs kept in small cages without exercise, love, or human contact develop undesirable behaviors and may become destructive or unsociable or bark excessively. Also, unlike humane societies and shelters, most pet shops do not inspect the future homes of the dogs they sell. They also dispose of unsold animals in whatever manner they see fit, and allegations of cruel killing methods abound. Poor enforcement of humane laws allows badly run pet shops to continue selling sick, unfit animals, although humane societies and police departments sometimes succeed in closing down pet shops where severe abuse is uncovered. In today's society, where unwanted dogs and cats (including purebreds) are killed by the millions every year in animal shelters, there is simply no reason for animals to be bred and sold for the pet shop trade. Without pet shops, the financial incentive for puppy mills would disappear. People looking for companion animals should go to animal shelters or breed rescue clubs. Although animals sold by local breeders escape many of the early miseries that dogs suffer at puppy mills, they are subject to the same physical problems caused by inbreeding that animals from pet stores often exhibit, and they also contribute to the overpopulation of companion animals with its attendant suffering. Only when people refuse to support pet shops, puppy mills and breeders will this chain of misery be broken.